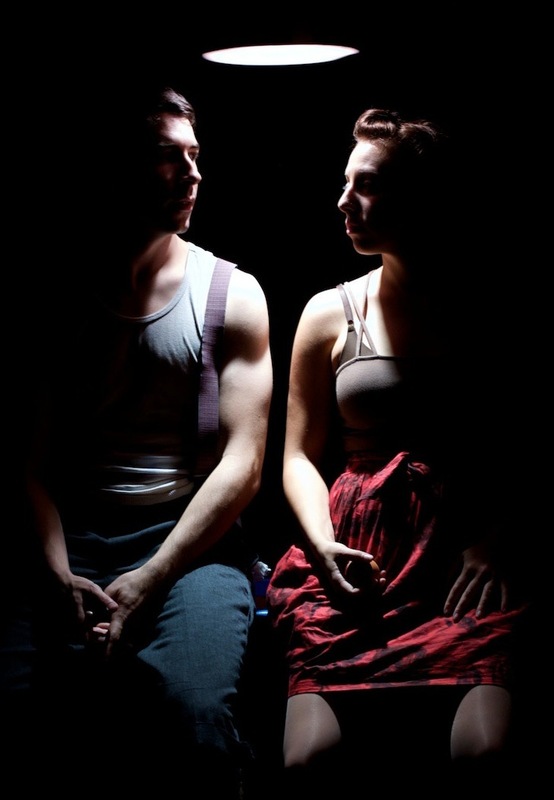 This month's title photo comes from Legs and All, currently at The Kraine Theatre, and features Summer Shapiro and Peter Musante. After winning the Festival Favorite Award at the 2010 FRIGID New York Festival, an award-winning, sold-out run at the 2009 San Francisco Fringe Festival, and their most recent run as part of the New York Clown Theatre Festival at The Brick in Williamsburg, LEGS AND ALL returns to Horse Trade Theater Group for a limited engagement, October 2-16 at The Kraine Theater. A man in an attic meets a woman in a box. As they lure one another into their worlds, their curiosity unfolds to expose a hilarious, mind-bending, innovative allegory for the classic man-meets-woman story. Rooted in physical comedy and drenched in imaginative stage illusion, LEGS AND ALL is an inventive exploration of human loneliness set to an evocative tango-meets-bluegrass score. LEGS AND ALL will play a special limited engagement on Saturday, October 2 at 2pm, Sunday, October 10 at 2pm, Thursday, October 14 at 8pm, Friday, October 15 at 8pm, and Saturday, October 16 at 3pm & 8pm at The Kraine Theater (85 East 4th Street between 2nd Ave and Bowery). Tickets ($20 / $15 for Students & Seniors) may be purchased online at www.horseTRADE.info or by calling Smarttix at 212-868-4444. 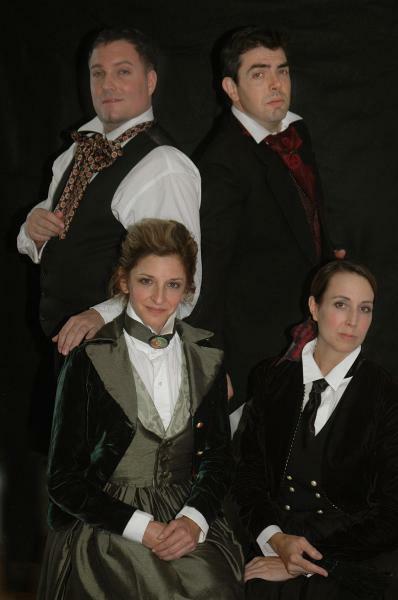 Devil Boys From Beyond, the 2010 GLAAD Media Award nominee and critically acclaimed winner of the 2009 Excellence Award For Outstanding Play at the NY International Fringe Festival, today announced it will partake in 8coupons’ off-Broadway OCHO LOCO! campaign to offer $8 tickets (Regularly $65) for select preview performances November 3 – 12, 2010. About the show: Summer of 1957 is a scorcher and something strange is going on in the swamps of Lizard Lick, Florida. With rumors of missing people and giant spaceships running rampant, star NYC reporter Mattie Van Burn races down in search of her next Pulitzer, her booze-hound ex-husband, Gregory Graham in tow, and her arch-enemy, Lucinda Marsh hot on her heels to scoop her story. Written by Buddy Thomas & Kenneth Elliott, Devil Boys From Beyond will make its off-Broadway bow at New World Stages, located at 340 W. 50th Street (between 8th and 9th Ave), with preview performances beginning November 3, 2010. This production marks an unprecedented collaboration between key artists from the seminal downtown theatre companies Theatre-in-Limbo (Kenneth Elliot, Andy Halliday, Vivien Leone, B.T. Whitehill) and the Ridiculous Theatrical Company (Everett Quinton). Devil Boys From Beyond is directed by Kenneth Elliott. Queens Theatre in the Park will present One Ride "a rip-roaring, spanking-new dance musical from the creators of Swango!" beginning on October 29th at Queens Theatre in the Park, Flushing Meadows Corona Park, Flushing, NY. From the press release: "One Ride's powerful and passionate story is told through the songs of country legend Chris LeDoux and the breathtaking choreography of Robert Royston, the man behind QTP's smash hit, Swango! Full of energy, dynamic movement and the live music of Chris' band, Western Underground, One Ride is a timeless tale about the quest to find the champion in ourselves! Conceived, directed and choreographed by Robert Roysten." Tickets are $34-40 (with varying Multi-Show, Senior, and Student discounts). Tickets are available at www.queenstheatre.org or by phone at 718-760-0064. Queens Theatre in the Park is a tax exempt, not for profit organization, funded in part by the New York City Department of Cultural Affairs, Speaker Christine Quinn and the Council of the City of New York, and Queens Borough President Helen Marshall. Queens Theatre's programs and events are made possible with public funds from the New York State Council on the Arts and the National Endowment for the Arts. Additional public funding is provided by members of the New York City Council and members of the New York State Assembly and Senate. * By phone at 718-760-0064, Tue-Sat, 12-6pm. * In person at Queens Theatre in the Park, Flushing Meadows Corona Park, Flushing, NY. * Subscriptions: Become a Theatre or Dance Subscriber by ordering tickets to all four Theatre Series events or all four Dance Series events and enjoy significant savings off the ticket price. * Multi Show: Order any three or more shows and earn the multi show discount price. This discount is available for any show this season. There is no limit on the number of tickets you can purchase at this discount. If you are already a Theatre or Dance Subscriber or have purchased at least two shows this season, you have already earned this discount on additional ticket purchases. * Groups: Contact group sales associate Barbara Matovu at 718-760-0064 x128 for groups of 15 or more. Queens Theatre in the Park is located in Flushing Meadows Corona Park, Flushing, NY. By Subway: Take the 7 train to Mets-Willets Point stop. Exit and turn left after passing through turnstile, walk downstairs on the parking lot side and follow the theatre shuttle signs. Take free trolley to the Theatre. Trolley runs for one hour before and after all performances. By Car: Take the Grand Central Parkway to exit 9E (from Manhattan) or 9P (from Long Island) and follow the signs for the Theatre. Free parking in adjacent lot. 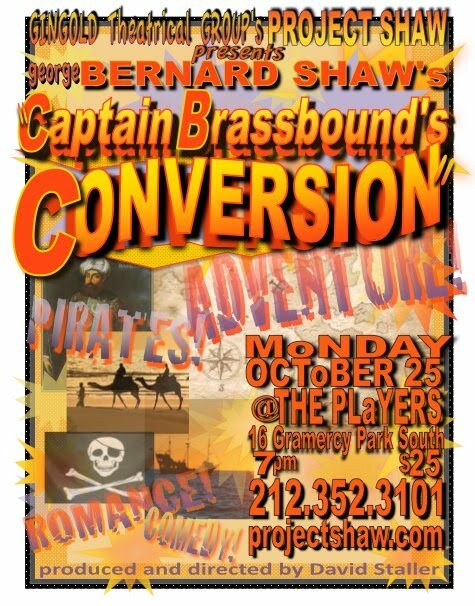 On Monday, October 25th at 7 PM, the Gingold Theatrical Group's Project Shaw will present a staged reading of Captain Brassbound's Conversion featuring Harriet Harris, Marc Kudisch, Matthew Baldiga, Ariel Estrada, Philip Glassborow, Glenn Kalison, David Ian Lee, Brad Oscar, James Rana, A.J. Shively, Paul Singleton and featuring Michael Riedel of the New York Post and Michael Feingold of the Village Voice. The reading is produced, edited, and directed by David Staller. From the press release, "CAPTAIN BRASSBOUND'S CONVERSION: A cult classic! One headstrong and determined woman sails to Morocco and takes on not only the infamous pirate Captain Brassbound, but a band of Arabs and the entire U.S. fleet! Shaw's rarely seen wild lark of a comedy about revenge, true love and high adventure is not to be missed!" The Project Shaw monthly reading series is one of the best hidden secrets (if you can call a show that sells out every single production a secret) in the city. Top-notch performers, excellent plays (naturally), and a great raffle are almost enough on their own, but adding in the wonderful setting of the Players Club takes it to another level. If you are a fan of Shaw and have never been to this series, shame on you. The remaining shows in 2010 are How He Lied to Her Husband and Heartbreak House. Tickets are available at www.projectshaw.com. CROFT VAUGHN (Playwright) is a Company Member of Wasted Theatre Education, (WTE) which specializes in bringing new shows to International and National Fringe Festivals. WTE recently created the Multi-Media Dance- Theatre Play, SportSexDeathPorn, which premiered at the Montreal Fringe Festival. He Co-Produced and starred in Nicky Silver’s The Altruists, in the European Premiere at the Edinburgh Fringe Festival in 2005, to 4 and 5 star reviews. Other original works include Shepherd a classical hero myth and gay love story, Glauce or Without Fear From the Abyss, a dance theater piece inspired by the Medea myth and the Chernobyl disaster, and Flight Light, a dance meditation on the paradox of a kite’s string. He wrote and directed They Want Us Dead, We Can’t Stay Here! which saw a sold out performance in the Hot! Festival at Dixon Place. His performance venues range from P.S.122, The Duplex Cabaret, and 59 E. 59 Theaters, to Dance Space Center, Dixon Place, Blue Heron Arts Center, Galapagos, and throughout the U.S. He toured with WTE Theatre to Edinburgh’s Fringe Festival in 2003. He performed at P.S 122 in Twas the Night Before the Twelve Days of a Nutcracker Christmas Carol, directed by Ken Nintzel. Newsday.com singled him out as “gloomy perfection” for his role of Fritz/Ignorance. Croft is on the Advisory Board for Skybetter and Associates, the contemporary dance company helmed by Sydney Skybetter. He has worked with downtown performance artists Ken Nintzel, David Neuman, Stacey Dawson, Penny Arcade, Synaesthetic Theatre, the T.E.A.M, and Jonathan Adam Ross. Croft was the Assistant Director for the Snoopy! Benefit Concert at Symphony Space starring Broadway’s Sutton Foster. Croft earned his first off-Broadway credit as Assistant Director for Joy, at the Actor’s Playhouse, with Ben Rimalower Directing. Other Assistant Director credits include the Unity Concert for Cover the Uninsured Week, BroadwayWorld.com’s Benefit Concert for Broadway Cares, Equity Fights Aids, and numerous staged readings at Manhattan Theater Club, Second Stage, and others. Croft studied Clowning with Giovanni Fusetti, Chris Bayes, and Orlando Pabatoy, Commedia with The Flying Machine, and Street Theater with Steve Wangh. He enjoyed a four-month performance- internship with Big Dance Theatre, where he assisted in the creation of Plan-B, and performed the work in progress at Jacob’s Pillow. He is a proud member of The Manhattan Prairie Dogs, NYC’s Premier LGBT Country-Western Dance Performance Troupe for 2 years running. He has performed with them across the US. Croft is a graduate of NYU’s Experimental Theatre Wing at Tisch School of the Arts. Tell me a little bit about Stinky Flowers and the Bad Banana. This production grew out of an earlier one-man version that you performed at the Edinburgh and Indianapolis Fringe Festivals. How did you go about building it out for a larger cast? The bones of the play are the original fairy tales, and the heart of the play lies in the relationship of Sinclair with his grandfather. I like casts of five so I gave Sinclair two older siblings, and two imaginary friends. Then I placed them in front of a hungry audience and made them tell these stories. What have you gained or lost from the original by going to an ensemble? I’ve lost a lot of control! These kids are rambunctious and not always interested in what I want them to do! I think what I gained most is the depth that a family has. It’s hard for kids who move around a lot, and they really have to depend on each other even though they get into fights. I really love the dynamic these siblings have; they go from being at each other’s throats, to rallying together to create a new fairytale. I understand that Stinky Flowers includes multi-media work, which seems to be a current trend, especially shows that were created for Fringe productions. What sort of multi-media are you using, and how do you feel it adds to your production? the projector, and let the audience read the words. It’s quite remarkable; it’s making me cry just thinking about it! Then for the finale, (SPOILER ALERT) we employ a hidden video projector. The projected image begins to move, and an animation mega mix takes over. In essence, the audience sees the children’s imagination come to life! You've got a terrifically diverse theatrical resume. What got you started in theatre to begin with? I was terrible at team sports. Really, I was very very bad. I would catch the baseball, and start running to tag the batter out. It didn’t help that I played outfield. When Kathy Stephan brought Nesbit and LaPurr’s Fairytale Theater to Greencastle, I was ecstatic. Stinky Flowers is an homage to my pre-professional training. I am profoundly fortunate to have worked with so many wildly talented artists, especially this cast and crew. They’ve made me a better artist for sure. If you could give one piece of advice to a young theatre student, what would it be? Cultivate your curiosity, protect it fiercely. Let the ‘little person inside of you that has never been told “no”’ drive your ambitions. And take up dancing. And never answer a question with only one answer. If you could say anything to the potential Stinky Flowers and the Bad Banana audience, what would it be? The audience is a character in the show, so I do hope you’ll join us (we need you!). This production is the culmination of a lot of hard work by many very talented artists. Sharing this show with you is an amazing feeling, one I hope you will get after seeing the show and inviting your friends to see it too. What's next for you after this production? Broadway, duh. Then Stinky Flowers will be turned into a Pixar feature animation film with a successful cartoon spin-off with loads of merchandise and maybe a sequel, I haven’t decided. But first, grad school! I’m writing a play triptych: The Opposite of Funny (is wrong), The Impossible Plays, and Monologues for Words that Don’t Exist. There’s an adaptation of the Medea myth in the works too. Oh, and I’ll be dancing at the Big Apple Ranch every Saturday night that I can. Tickets ($18, $15 students/seniors, $10 for kids) are available by calling Smarttix at 212-868-4444 or online at www.smarttix.com. Red Bull Theater seeks new 10-minute plays for our spring short play reading day. New plays of no more than 10 pages, written in heightened language, in verse, with classic themes, adaptations of classics, or that otherwise fit our mission and history are welcome. Click here for more information and guidelines for submission. Using heightened language, contemporary playwrights respond to the classic themes and stories from Red Bull Theater’s mission. Directed by Timothy Douglas and Wendy Goldberg. Click here or visit www.redbulltheater.com/Collaborate for details. Write wendy@redbulltheater.com with any questions. Cody Daigle's latest play, A Home Across the Ocean, is given a stellar production by Maieutic Theatre Works. This play about two gay men, Connor (David Stallings) and Daniel (Mark Emerson), who decide to foster a child, Penny (Lavita Shaurice Burr), who silently pines for her lost family, and Connor's mother Grethe (Alex Bond), a recent widow who struggles to build a new life with an old love (Dathan B. Williams), is touching and exceptionally well written. The cast is outstanding, with particular praise to Alex Bond as Grethe, Lavita Shaurice Burr as Penny, whose silence seems to carry the weight of the world, and David Stallings as Connor, who quickly finds himself drowning under the weight of a radically changing life. Maieutic Theatre Works continues its string of excellent productions with A Home Across the Ocean, and continues its productive collaboration with Daigle, whose work Providence Maieutic produced in 2008.